Spotlight on: Butcher & Butcher Construction Co. In 2015 the team at Butcher & Butcher Construction Co., Inc. served as the roofing and waterproofing contractor for two custom homes built by Thomas Sebold & Associates in Birmingham, Michigan. Here are insights from Mark Dalrymple, President of Steep Roofing & Sheet Metal Operations at Butcher & Butcher. Q: The two homes you re-roofed are side-by-side. Both homes gained large additions to existing structures. What was the role of Butcher & Butcher? 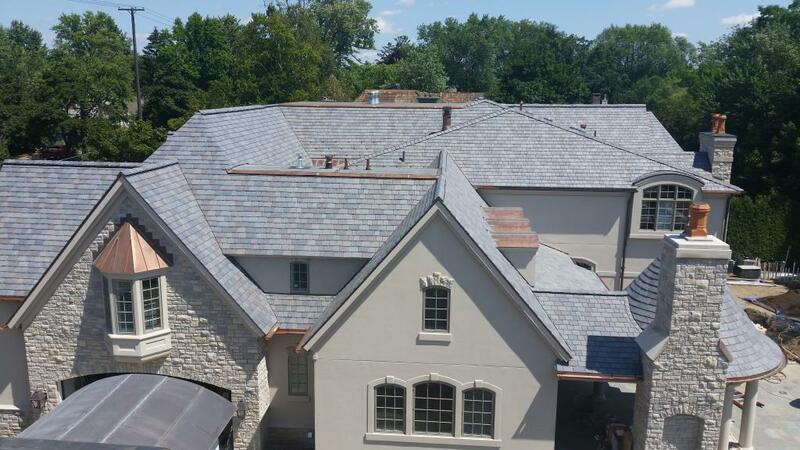 A: As an industry leading contractor for high-end residential roof installations, Butcher & Butcher was contracted for installation of DaVinci Roofscapes Multi-Width Slate for each designer roof. One home has the Castle Grey blend synthetic slate shingles and the other homeowner chose to create their own custom color blend of Castle Grey, Medium Tan and Dark Purple for their luxury roof. Both DaVinci roof projects were completed with copper flashings, half round copper gutters & downspouts, copper barrel dormers and copper standing seam roofs. Q: Your company has installed DaVinci composite roofing for more than 10 years. How do you compare the DaVinci roofing tile to other competitors? A: DaVinci Roofscapes has proven themselves in the synthetic slate and shake industry as the best. I've had many experiences with other manufacturers' synthetic material failures. I've never had a failure with DaVinci or heard of a failure with DaVinci. As a result, I've singled out DaVinci as the only polymer roofing material I will work with. Q: What specifically keeps you coming back to DaVinci synthetic roofing material? A: Compared to other roof system types, DaVinci gives a great natural slate roof appearance with many additional benefits to the homeowner. Their consistent high quality lightweight roofing materials are a benefit to me as the installer. And, the large selection of color options provides my clients with the opportunity to choose a roof to their individual liking. Q: How important is the lifetime limited warranty offered by DaVinci to you and your customers? A: DaVinci's got our backs. The actual fine print of the warranty and its coverage is very important to me as an installer because if there were to be any failures I am the first contact for the owner. I only install the best materials with the best warranties, which is another reason I install DaVinci. Need a roofer for your next project? See How to Find a Contractor for tips from DaVinci!